Gasur was an ancient Mesopotamian city which was located to the south-west of modern Kirkuk in Iraq, near the Tigris. The city seems to have been founded by the Akkadians in the twenty-fourth century BC, towards the end of the Sumer period. It was renamed Nuzi (or Nuzu) when it was occupied by the Hurrians of Arrapha after around 2000 BC. It became a prosperous community and an important administrative centre. It had its own 'mayor' who was dependent upon the Hurrian king of Arrapha. From about 1500 to 1350 BC Nuzi was on the outskirts of the powerful Hurrian kingdom of Mitanni (still with its own mayor) before it was absorbed into the expanding Assyrian kingdom. Note that while the Hurrian period is well known because those levels of the modern archaeological site of Yorgan Tepe (or Yorghan Tepe - ancient Nuzi) have been fully excavated, the earlier history of the town is less clear thanks to only limited digs at these levels. The history of Nuzi is closely interrelated with that of the nearby towns of Eshnunna and Khafajah. Having emerged as a recognisable group during the short dark age of the twenty-second century BC, the Hurrians have already founded kingdoms at Urkesh and Nawar, based around the two cities of the same name in northern Mesopotamia. Around this time, 2000 BC, they also form the small state of Arrapha in the same region, seemingly after coming to dominate the city and form the majority population at the expense of the Assyrians who had previously dominated here. This state also includes the nearby city of Nuzi, which is governed by a mayor who is dependent upon Arrapha. 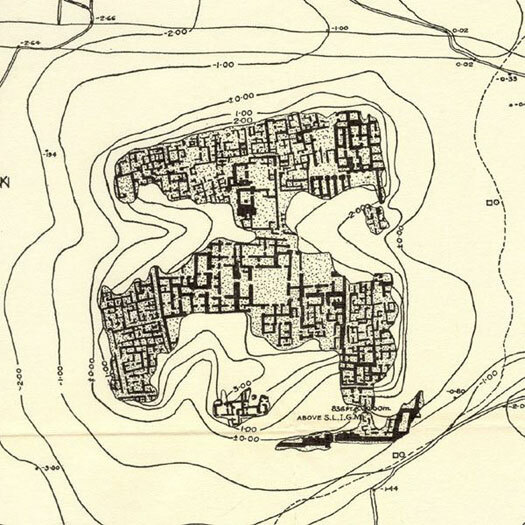 The town of Gasur (now the archaeological site of Yorgan Tepe, shown here in sketch form) was apparently founded during the Akkadian empire period in the late third millennium BC, before being taken over by Hurrians who renamed it Nuzi. Perhaps a decade before this date the Hurrians of Mitanni had been devastatingly defeated by the Hittites in a shock reversal of fortunes. Also losing territory in Syria to the Hittites, the Hurrians now became Hittite vassals and their kingdom rapidly declines. A confused period develops with rival claimants and short-lived rulers hastening the process of decline. Tushratta of Mitanni is assassinated around this time, possibly by his successor, sparking a fresh dynastic struggle which allows the resurgent Assyrians to reclaim the important administrative centre of Nuzi on the edge of the kingdom. It seems likely that Arrapha is lost at the same time when it is destroyed by the Assyrians. Nuzi subsequently declines in importance.